The machine is fine. It’s the Barista which is the problem... sort of. I researched milk temperatures on the forum and figured out I was steaming for too long. The temperature on the thermometer rises quite a lot after steaming has finished. The thing that was confusing is that using the same pitcher and thermometer on a Gaggia Classic resulted in a cooler drink. I expect that steaming/heating probably took longer on the classic, (and I used to make larger drinks) so probably less apparent gain in temperature after steaming. By all means, keep the thermometer if you want, but also train your hand to know when to stop by temperature. For instance, hold the pitcher and keep your fingers touching the lower side or bottom of the jug. When it feels too hot to touch, close the steam tap. Clean it with a wet cloth, tap tap the jug, swirl a few times and pour. I find milk thermometers just get on the way. It’s a good aid, but in my case I used it a couple of times and find that my own on skin sensors are more practical and more responsive than the mechanical one. I stop at 120 and it keeps going on the counter to about 140 to 150! So maybe we aren’t so far apart in the end. I use full fat Waitrose organic tree hugging mega expensive milk. I don’t know how much exactly (120ml I guess). Takes probably 40s though with standard two hole wand. I imagine using your hand is like having your fingerprints burnt off. You get your fingers burnt just once - then you always know when to stop.....! When I view my last post on Tapatalk it doesn’t show up. Hopefully this will show it properly. The website is fine. I used to use the plam if my hand on the bottom of the jug to judge temp..and got good results. I decided to stop as the skin on my palm started peeling!! Now use a temptag tri sticker...which works well and is less painful. I also got a group thermometer. To my surprise, the group does seem to run hot. It would get to 97 or probably 98 if left long enough. To cool this down to 94 or so, I’ve found that you’d have to do something significant - basically make a drink to drop the resting temp by 2 degrees. The flush and go method is confusing, as it doesn’t appear to make much difference, with a short flush at least. 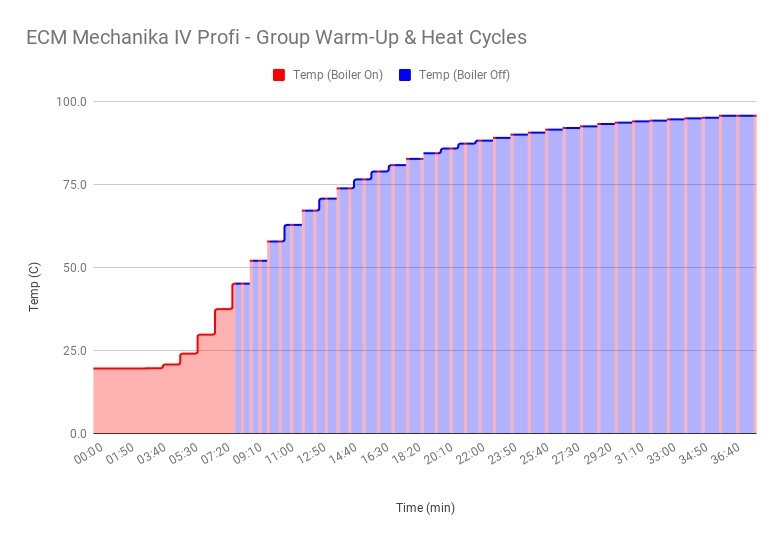 If the group is at 96 before the cooling flush (to the end of flash boiling), the temp spikes by about 2 degrees before dropping, but only back to where it was really. The temp during the shot is also then 2 degrees higher, but does fall by 1 degree during the length of the shot. If the group is at 92 (my current preferred spot) then you get a shorter flush to the end of flash boiling. The performance is similar though. The temp during the shot would be 94 to 93. So it seems that machine does run hot to me. This would be okay if plumbed in, but is a pain if on your on bottles. It’s okay if you catch the machine at the right temp while it’s heating up. I’ve copied the graphs from the other thread here in case it’s useful. My experience was that the group should run hotter at idle than brew as yours is - up to 98 or more after a long idle. For me it was only from 3rd shot onwards that group head temp at idle was less than desired brew temp at which point I moved to no flush and let the heat of the super heated water in the HX actually warm the group head during the shot - so the thermal effect was reversed. I will consider deciphering what you just wrote over a few pints and a bottle of wine. There’s always something to learn. It’s why I like this hobby more than most others. Ha yeah sorry buddy - just reread it and it’s one of those that definitely makes sense...... to the writer!